Beyond the Beyond (Bruce Sterling) reports on Architecture Fiction: Pixel City – Procedurally generated city. I want to live here. This paper addresses the problem of interactively modeling large street networks. We introduce an intuitive and flexible modeling framework in which a user can create a street network from scratch or modify an existing street network. This is achieved through designing an underlying tensor field and editing the graph representing the street network. The framework is intuitive because it uses tensor fields to guide the generation of a street network. The framework is flexible because it allows the user to combine var- ious global and local modeling operations such as brush strokes, smoothing, constraints, noise and rotation fields. Our results will show street networks and three-dimensional urban geometry of high visual quality. Carlos A. Vanegas, Daniel G. Aliaga, Bedrich Benes and Paul Waddell (2009) “Visualization of Simulated Urban Spaces: Inferring Parameterized Generation of Streets, Parcels, and Aerial Imagery“. IEEE TRANSACTIONS ON VISUALIZATION AND COMPUTER GRAPHICS,	VOL. 15,	NO. 3,	MAY/JUNE 2009. Urban simulation models and their visualization are used to help regional planning agencies evaluate alternative transportation investments, land use regulations, and environmental protection policies. Typical urban simulations provide spatially distributed data about a number of inhabitants, land prices, traffic, and other variables. In this article, we build on a synergy of urban simulation, urban visualization, and computer graphics to automatically infer an urban layout for any time step of the simulation sequence. In addition to standard visualization tools, our method gathers data of the original street network, parcels, and aerial imagery and uses the available simulation results to infer changes to the original urban layout. Our method produces a new and plausible layout for the simulation results. In contrast with previous work, our approach automatically updates the layout based on changes in the simulation data and, thus, can scale to a large simulation over many years. The method in this article offers a substantial step forward in building integrated visualization and behavioral simulation systems for use in community visioning, planning, and policy analysis. We demonstrate our method on several real cases using a 200-Gbyte database for a 16,300-km2 area surrounding Seattle. Chao Yang, Peng Zeng and Yi Wang (2010) “Modeling the Evolution of Urban Road Networks: A case study on Pudong New Area in Shanghai” 2010 International Conference on Intelligent Computation Technology and Automation. to visualize the differences with the real data in ArcGIS. Then, a case study of road network in Shanghai Pudong New Area is given, several common indicators are calculated. The results show good agreement between real data and model to verify the model is correct and valid. Against the backdrop of rising gas prices, growing suburban poverty, continued sprawl and uneven transit availability in cities and suburbs, the Metropolitan Policy Program at Brookings will release a first-of-its-kind analysis that shows how transit systems link workers to jobs in metropolitan America. The analysis informs critical policy and investment decisions at a time of scarce public and private resources. Vice President and Director of Metropolitan Policy Bruce Katz will moderate a dialogue with U.S. Housing and Urban Development Secretary Shaun Donovan and U.S. Transportation Secretary Ray LaHood. I reviewed an earlier draft of this report, and the research in here is important in advancing consistent measures of transit accessibility across cities. This will be a baseline on which other metropolitan comparisons of accessibility can be compared. 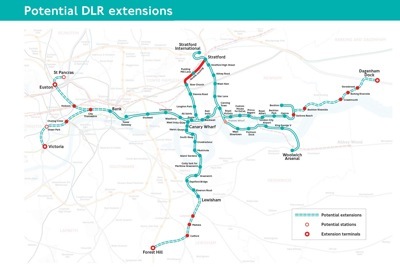 London Reconnections discusses possible extensions to the Docklands Light Railway, shown in the figure. The official version is here: DLR – Development Projects – The future of DLR – Where we go Next. The privately operated (under franchise agreement) DLR opened in 1987, after 3 years of construction and just a few years after conception (in 1982 according to TfL (though antecedents can be seen as early as the 1973 Docklands Study, according to the London Dockland Development Corporation) ), to serve the emerging Docklands regeneration project centered at Canary Wharf. Containerization of shipping changed the nature of the industry, which migrated in the 1960s and 70s from London to Felixstowe. The Docklands development replaced the newly abandoned shipping docks in East London with an emerging financial center, an American-like downtown for London. Almost immediately upon opening, construction started on extensions. Success begat success, and proposals and funding for extensions to this new, Docklands-centered automated public-transport technology continued to flow in. As can be seen from the top map, extensions continue to be proposed, notably to Charing Cross. The early DLR segments took advantage of abandoned railway lines, and while not a green-field, it was a relatively open brown-field canvas on which to work. The planning for the Jubilee Line, then the “Fleet Line” (after Fleet Street and the River Fleet), apparently began around 1965. The first section opened in 1979, two years after the Silver Jubilee of Queen Elizabeth for which it was named. The line temporarily terminated at Charing Cross station, as shown in the poster. It was to continue eastwards, along Fleet Street.In 1999 the Jubilee Line was extended to Canary Wharf as well, but this eastward extension resulted in the abandonment of the then 20-year old extension to Charing Cross, as a new routing split from the old in Green Park. The decision to do this can be seen as early as the 1990 Jubilee Line Extension options map. At this point the expensive Charing Cross station was just over 10 years old. Stations are often more expensive (and require more tunneling volume) than the lines which they connect, so this is a major rethink, not some temporary train halt which was subsequently bypassed. Jubilee Line Extension is said to have cost 3.5 billion pounds, which delayed other significant potential construction projects, such as Crossrail and the Chelsea-Hackney line. No one in the 1970s anticipated abandoning the Jubilee line portion of Charing Cross station, certainly not so soon after construction. No one in the 1970s (or 1980s or 1990s) anticipated that the DLR might one day reoccupy Charing Cross station, or even construct such a large cross-London network centered on the Docklands. (I did see speculation about this in the first decade of the 2000s). While the Underground system is centered on the Square Mile of the City of London, with many branches and a Circle Line, DLR has a new hub, with a new technology, that inter-connects with the old at several key stations, and if the extensions are built, at several more. In order to build anything, you must have a vision. Rarely does construction start without a fixed end point in mind (this is not SimCity) That construction once made is largely irreversible, though it may be abandoned, and it provides opportunities for reuse, it creates “facts on the ground” that are hard to undo. The City of London street network is a perfect example. Even after the Great Fire of 1666 or the bombings of World War II, it greatly resembles the facts on the ground at the time of William the Conqueror. In order to move forward, you must be willing to abandon old visions. The DLR and Jubilee Line Extensions were new visions, built on top of (and beneath) old constructions, not old visions. They were even willing to abandon one major fact on the ground (Charing Cross station) so as not to be wed to a vision that no longer worked. Facts on the ground create new constraints, new opportunities, new ways of looking at the world. There are many possible lines in a network, but only a few can actually be built. We are far from “optimal”, and I suspect we always will be, but we need to consider what is the best decision given the world as it exists, not the world as it might be according to some plan. We ought not be too locked into our plans, we forego many opportunities by clinging to the zombie maps of long-dead officials.